Nitrosoprodenafil is a synthetic designer drug found in "herbal" aphrodisiac products, which is a novel nitrosated analogue of sildenafil (Viagra). It has an innovative structure which acts as a prodrug, breaking down in the body to release both the PDE5 inhibitor aildenafil as well as free nitric oxide, which have powerfully synergistic effects. This dual mechanism of action has never been exploited by conventional pharmaceutical companies because of the risks involved; usually combining PDE5 inhibitors with nitric oxide releasers like amyl nitrite is contraindicated as it can cause a precipitous drop in blood pressure that can potentially result in death. Nitrosamines are also generally avoided in drug development as they can often be hepatotoxic, so while the combined mechanisms of action are likely to be effective, this drug also has severe risks of toxicity. Shortly after Venhuis et al. 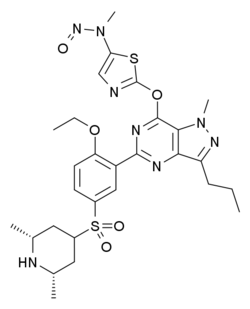 published the suggested structure for nitrosoprodenafil it was contested by Demizu et al. who suggested the structure was an azathioprine / aildenafil hybrid. 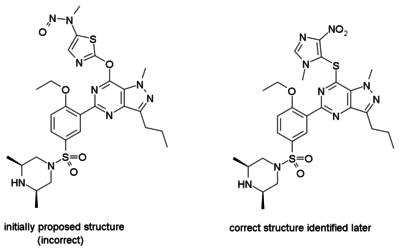 This newly suggested structure was dubbed 'mutaprodenafil' because of the structural similarity with the mutagenic azathioprine. The final confirmation of the azathioprine / aildenafil hybrid was provided by Sakamoto et al. who prepared crystals for X-ray analysis. Although Sakamoto et al. support the name 'mutaprodenafil' they prefer to use 'nitroprodenafil' instead. ↑ Venhuis, B. J.; Zomer, G.; Hamzink, M.; Meiring, H. D.; Aubin, Y.; de Kaste, D. (2011). "The identification of a nitrosated prodrug of the PDE-5 inhibitor aildenafil in a dietary supplement: a Viagra with a pop". Journal of Pharmaceutical and Biomedical Analysis. 54 (4): 735–741. doi:10.1016/j.jpba.2010.11.020. PMID 21145686. ↑ Demizu, Y.; Wakana, D.; Kamakure, H.; Kurehara, M.; Okuda, M.; Goda, Y. (2011). "Identification of Mutaprodenafil in a Dietary Supplement and its Subsequent Synthesis". Chem. Pharm. Bull. 59: 1314–1316. doi:10.1248/cpb.59.1314. ↑ Sakamoto, M.; Moriyasu, T.; Minowa, K.; Kishimoto, K.; Kadoi, H.; Hamano, T.; Fukaya, H. (2012). "Structure Elucidation of a Novel Analog of Sildenafil Detected as an Adulterant in a Dietary Supplement Using LC-UV and LC/MS". Journal of AOAC International. 95 (4): 1048–1052. doi:10.5740/jaoacint.11-235. This article is issued from Wikipedia - version of the 5/24/2016. The text is available under the Creative Commons Attribution/Share Alike but additional terms may apply for the media files.